Summary: The manufacturer’s description and specs, and the average user rating for the Smith & Wesson Model 22 – Model of 1917 Centennial revolver. To commemorate the reintroduction of the Model 22 – Model of 1917, the Smith & Wesson Custom Engraving Department will hand engrave 20 of these unique handguns. These exquisite firearms will be covered with Class A engraving, surrounded with inlaid 24kt gold borders. What also makes these revolvers so highly collectible is the fact that they will carry a special serial number range, CLM0001–CLM0020. For that final touch, you will be shipped a glass top cherry stained presentation case to proudly display your lavishly engraved firearm. 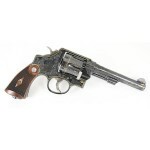 Smith & Wesson’s Model 22 – Model of 1917 Centennial is a six-round revolver chambered in .45 ACP and built on a carbon steel frame with a carbon steel cylinder. Sporting a blue finish, this pistol features an Altamont wood grip, a pinned half-moon service front sight, and a service rear sight. This entry was posted in .45 ACP, $7,001-$7,500, Full size, Revolver, Smith & Wesson on June 22, 2010 by Staff.